Another giveaway is here and rightfully so! Halloween is my favorite time of year. 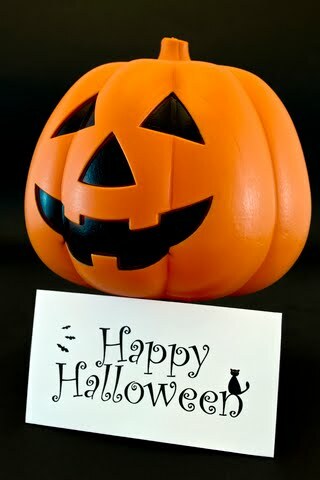 What better way to kick-start October than with a Halloween themed baking giveaway. I love anything to do with Halloween. Costumes, candy corn, pumpkins, cauldrons, dark eerie nights, flying bats, zombies, the cackle of witches... you name it, I love it. I start decorating as soon as October 1st hits. And I start baking spooky creations as early as September! During a recent shopping spree I saw some super Halloween themed baking supplies I couldn't resist picking up for this giveaway. I hope you think they are as cute as I do! 1. A fun set of test tube sprinkles by Wilton. 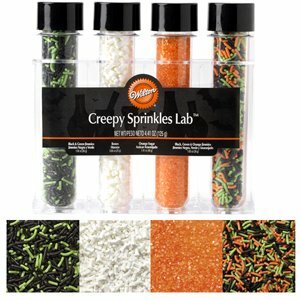 The Creepy Sprinkles Lab contains orange sugar, white bones, green and black sprinkles, and finally green, orange and black sprinkles. I have my own set and recently used them to decorate my Chocolate Butterscotch Cupcakes. 2. A great set of 32 Spiderweb Baking Cups by Cupcake Creations. What makes these so great? Well they are super sturdy so you don't need to use a muffin tin at all. You just place the cupcake liners right onto a cookie sheet and fill with batter. Plus , there is a pumpkin spice cupcake recipe on the back of the package which I am hoping you will try ! 3. 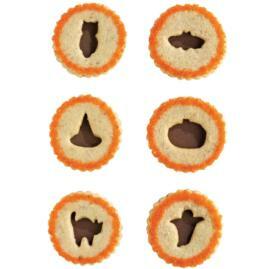 A fantastic Linzer Cookie Cutter Set by Wilton. This set includes 6 different shapes: Bat, Pumpkin, Cat, Owl, Ghost and Witches Hat plus an easy-to-make cookie recipe and instructions on how to use the Linzer set to get great results! This giveaway will not be open that long for submissions to ensure the winner receives the goodies in time for Halloween. So act fast and don't miss out on your chance to win ! Be a follower of this blog and add a comment to this post stating you are a follower. To follow, simply scroll down on the right until you see the Follow button in the sidebar. Then join up! Please do ensure that you meet the minimum requirement or I regret to say that your entry won't be counted. Provide a link to your blog in your comment and leave the post/link on your blog for 1 more week after the giveaway has closed for compilation purposes. Contest closes 11 PM EST, Saturday October 8th, 2011. An online random selection tool (@ random.org) will be used to select the winner. Name of winner will be announced on Lemon Drop the following day and a request will be issued to the winner to contact me privately. The winner has 24 hours after winner announcement to contact me and claim their prize. I just followed! I'm a new GF baker (my husband's boss is GF and he gets left out of the treats I send to work unless I make something for him) Thanks for the great recipes! I am a follower and I love it; I've already made several of your recipes and they're yummy every time. I'm a long time follower of your blog, and would love to win! What fun it would be to use these! I have three toddlers and they would love to help make some treats with them. I love this time of year! I'm a current follower. I added your button to my blog :) Thanks for the chance to win this fun set. Hope you'll enter me in your give away! Last time I tried you said I must be in the wrong one-cause I'm a farmer and yours was a cooking blog!! I am multi-talented!! :) have a beautiful day-your goodies always look delicious!! am a follower!! Thank you for such an amazing giveaway :) I am a new follower. I am a new follower via your blog and email updates. I'm a new follower! Love your blog and I've shared this with my followers. I added a link to the sidebar on my blog for your blog. I am following your blog. Found you through the Something Swanky blog hop! I follow you via RSS feed! GFC follower Soozle ... and thanks for the giveaway! Giveaway now closed - no further submissions will be accepted. Stay tuned for winner announcement!